I really love floral print dresses. 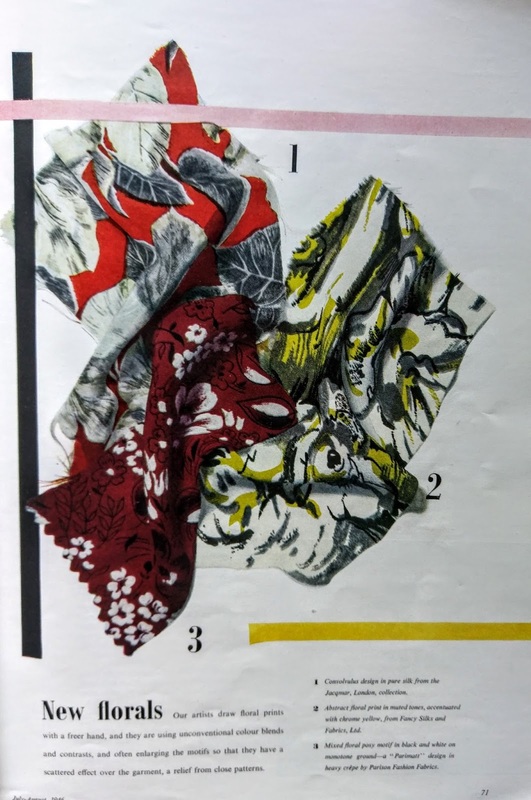 Not only do they look sweet and summery the mutiple colors in the prints make them easy to combine with a number of coats, cardigans and accessoiries. 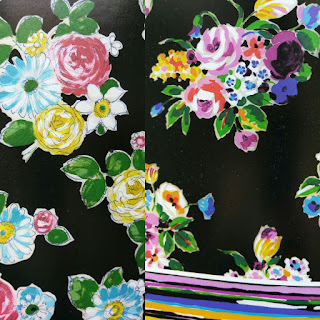 I had planned to write this blog on floral dresses a little later but when I went out for lunch in one of my favorite florals a few days ago I got so inspired. 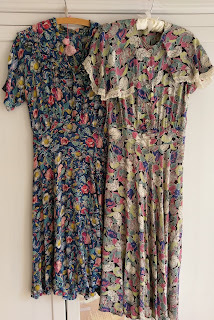 I found this dress (in the picture above) years ago when there was still an Episode (it was the best!) in Antwerp. The hat is a recent purchase that goes so well with it! 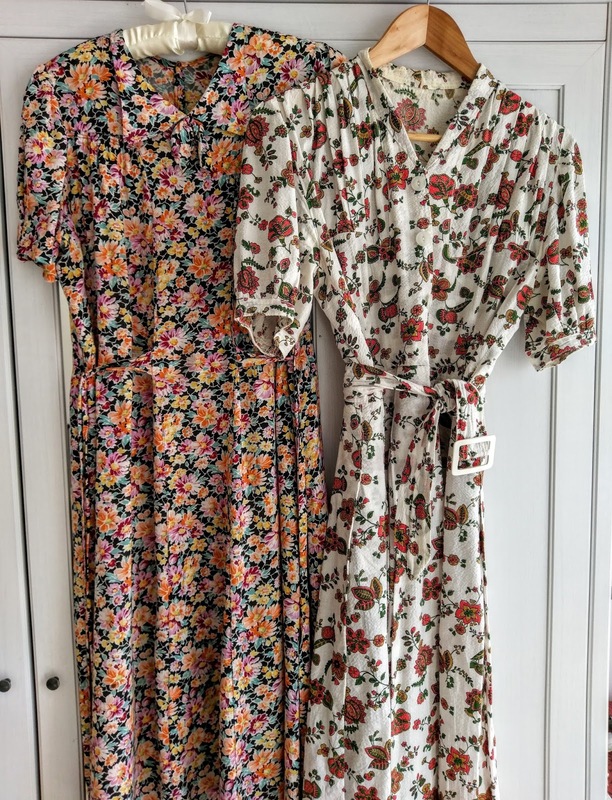 Shopping for the sring/summer season usually starts with the purchase of a floral dress for me. 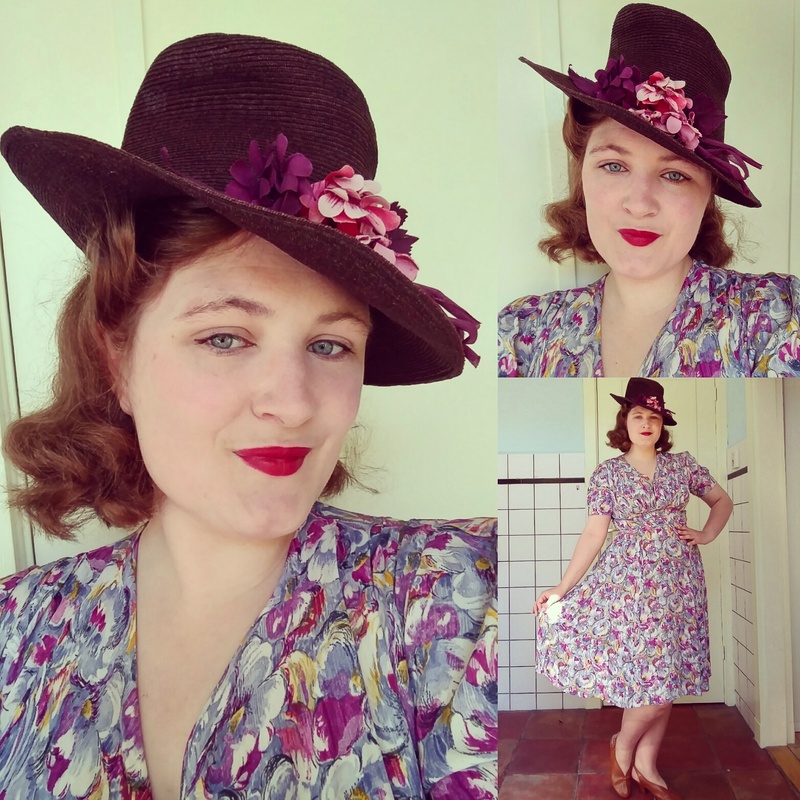 This year it was an amazing 30's silk crêpe. 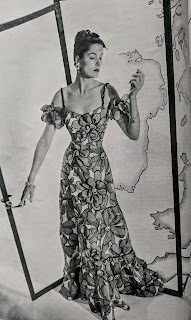 The fabric is ever so thin making the fact that this dress survived in good condition all the more special. It was listed on 'Marktplaats' as 'perhaps from the 50's', well I saw immediately what it was and bought it. 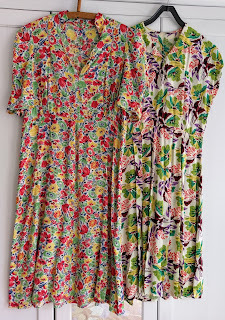 The cap sleeves and thin natural fabric make it perfect for hot summer days! 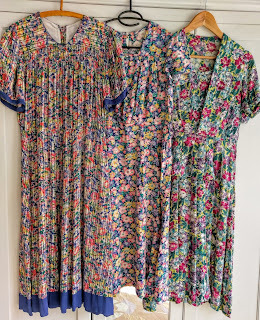 A dress like this and some warm days last week made me want to explore my own closet and review what I've actually already got. 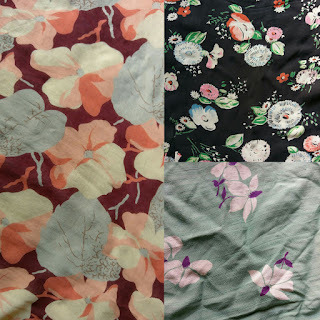 It is something I often do at the beginning of a season, maybe not as good as shopping, but still there are always forgotten treasures or long lost summer friends. 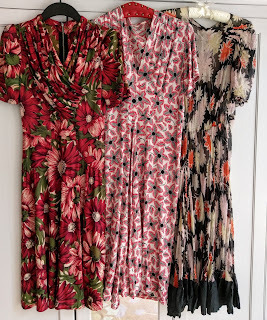 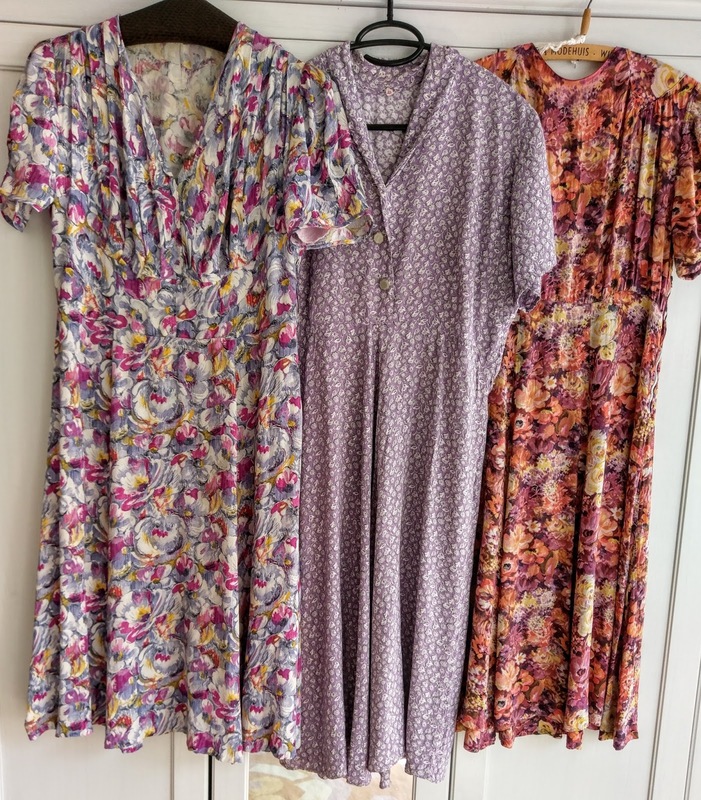 & the fact that I wanted to try out the camera on my new phone: In this blog some examples from my own wardrobe and also a few historical sources. 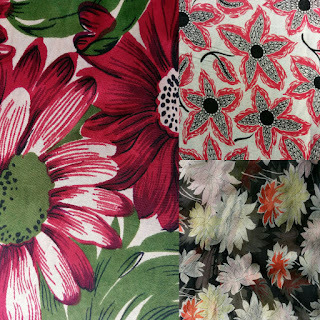 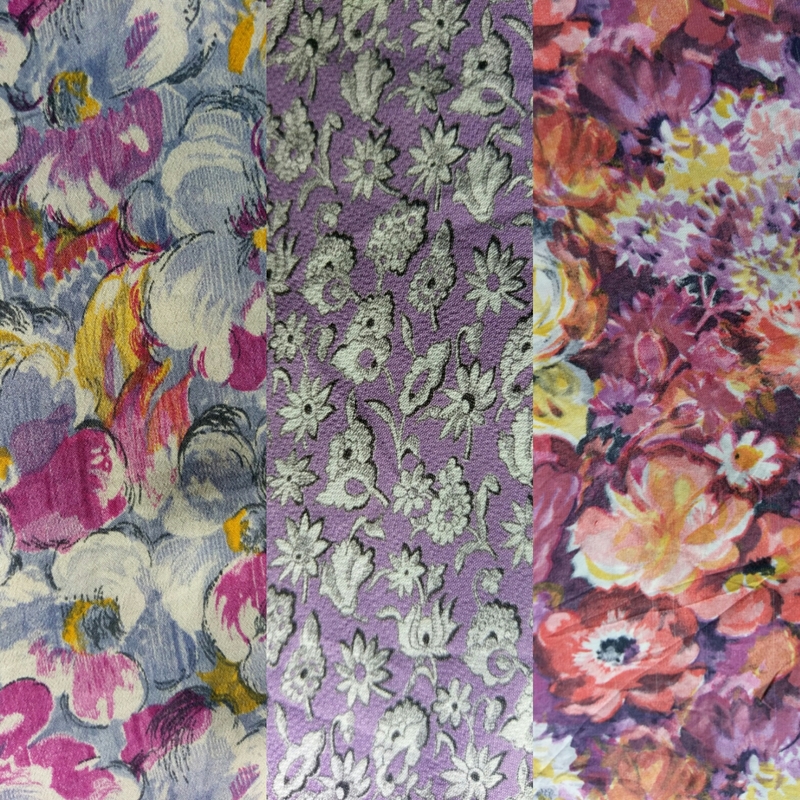 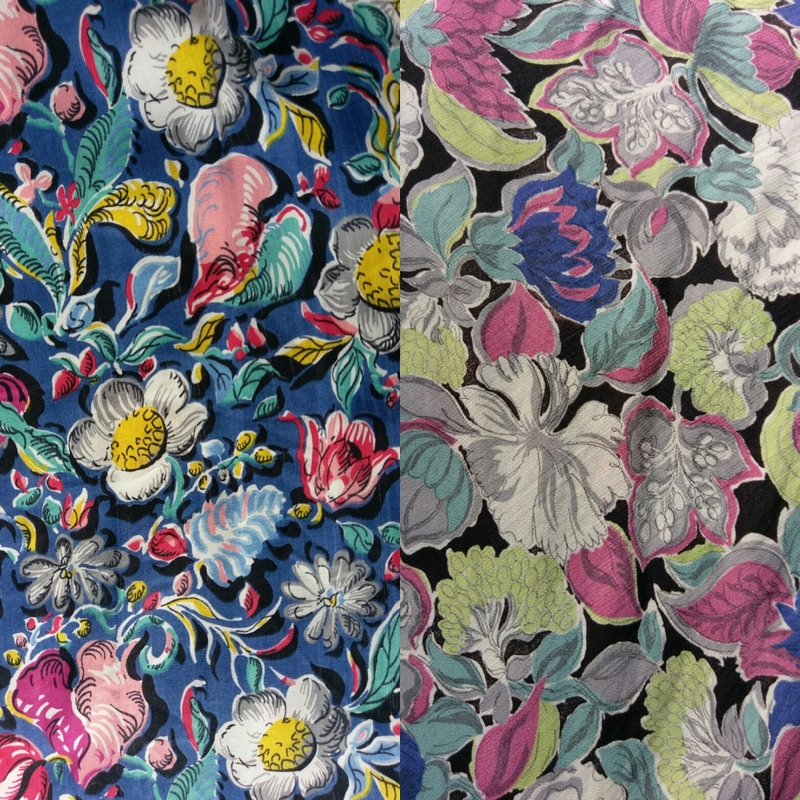 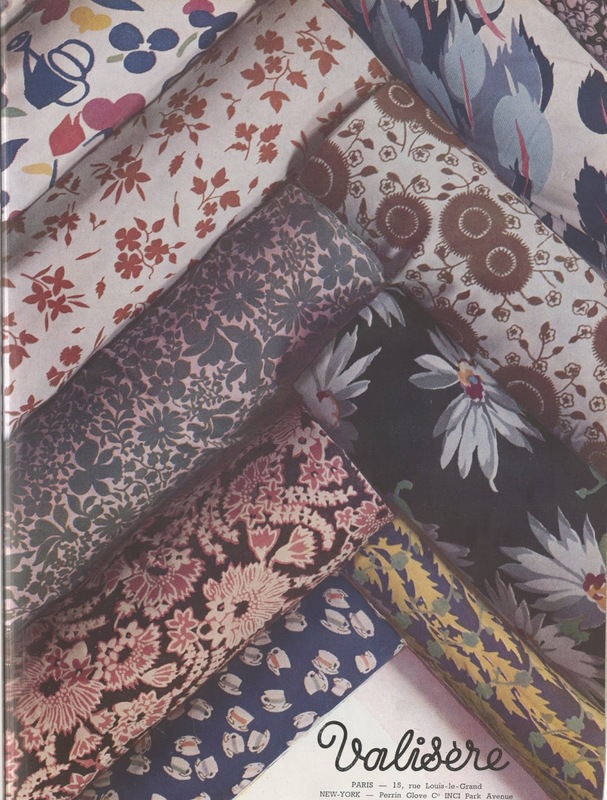 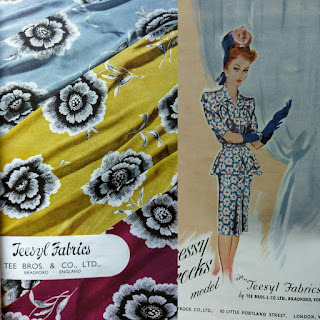 I will start with what I have found in my closet, first a collage of some prints with a fabric description followed by a picture of the garments in question. 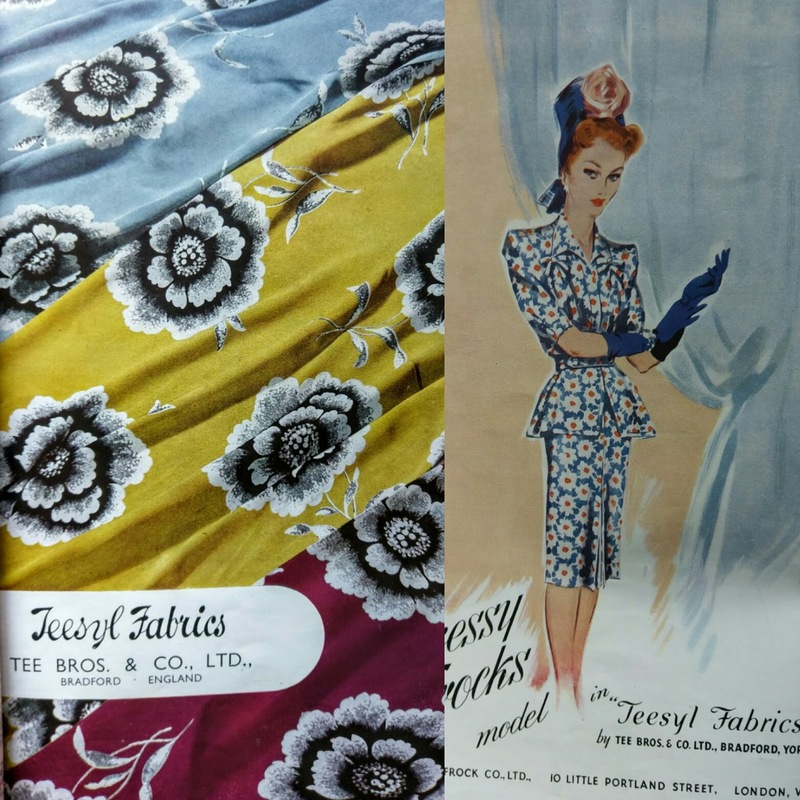 Fabrics can also help dating a garment but they can put you on the wrong track as well. 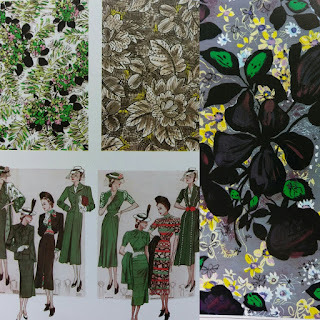 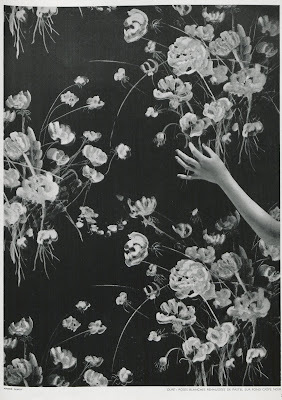 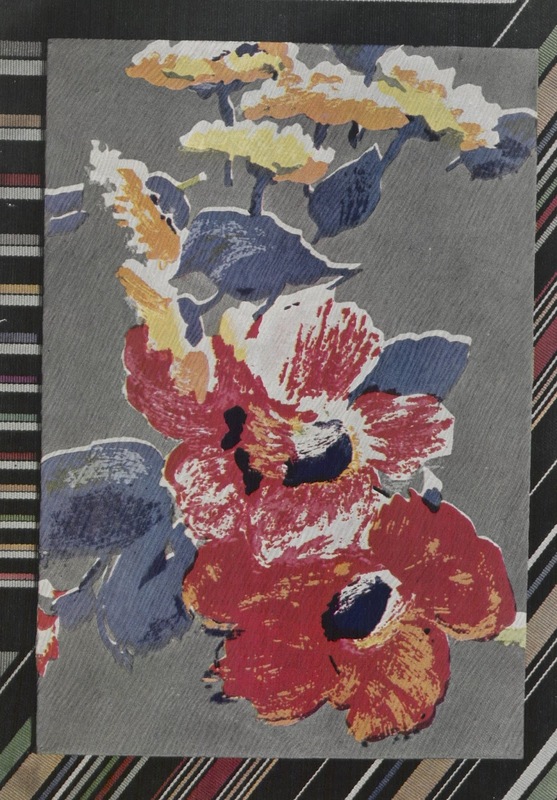 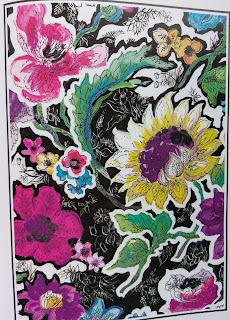 I associated the expressive florals with thin black lines with the second half of the the 40's and with the first example above this is the case. 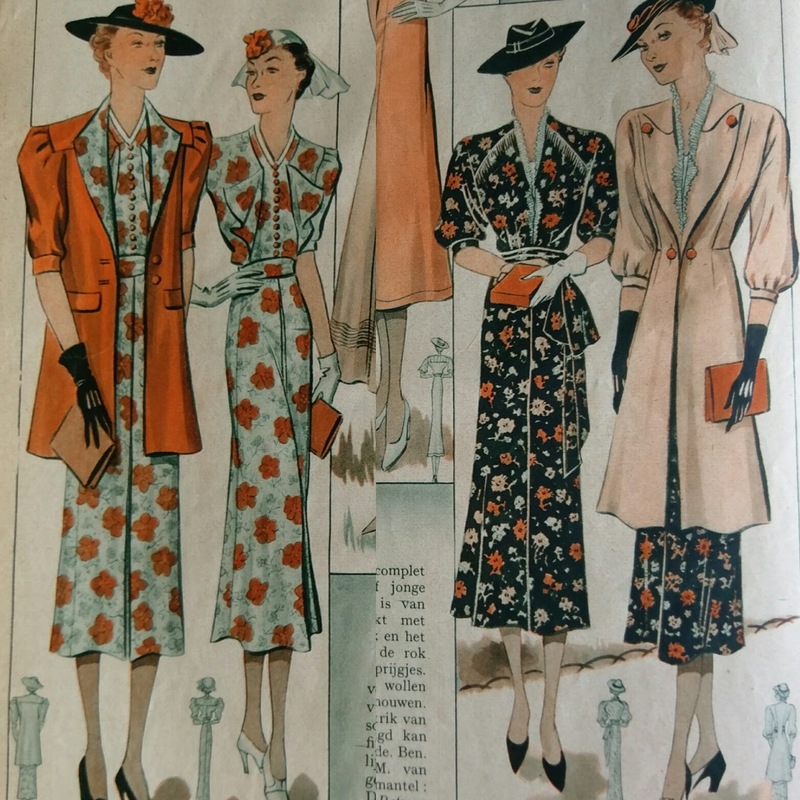 The second fabric is from the 30's however due to the style of the dress. 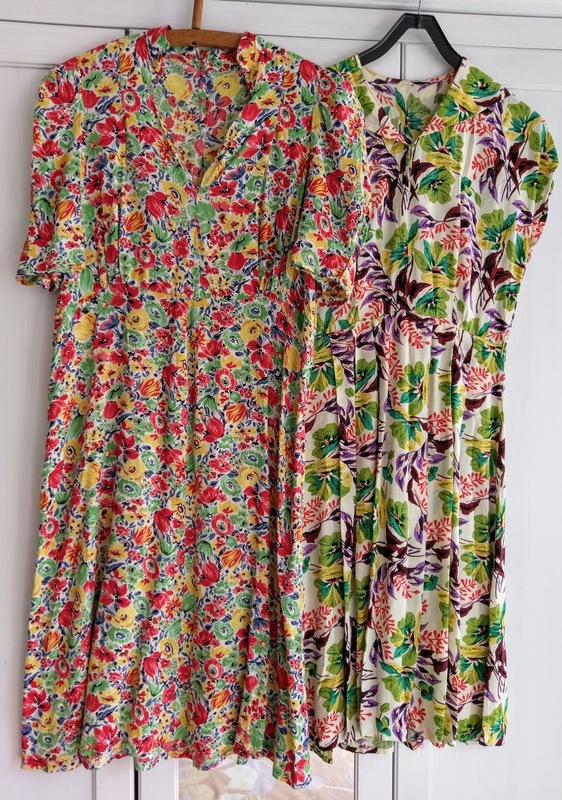 The dress on the right was a bit of a puzzle because it had been altered and a zip had been added later. 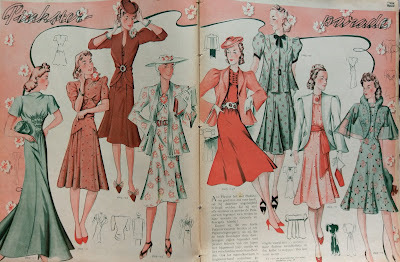 If you want to find out if something is an alteration/later addition it helps to check the seams: if the stitches/color of the thread differ from the rest of the garment this is often an indication for that. You see how different the garments are, the fisrt dress is in a right fixer upper state a project I hope to get down to soon, the second is a bathing suit I've found at a fleamarket for a euro, I was first attracted by the fabric, but it turned out to be quite waerable, thirdly a floral evening gown I've worn many times as it is so versatile due to the similarity to a modern maxi-dress. 1940's plain cotton and 1940's or 1970's cotton seersucker. 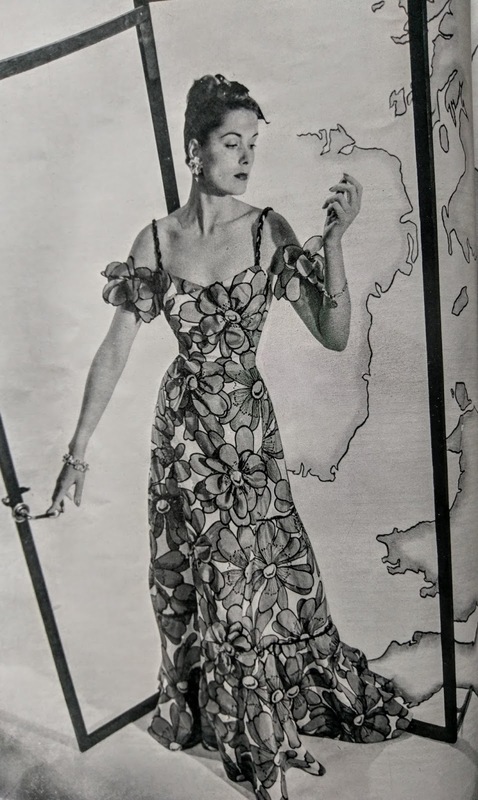 For this second dress the fabric still puzzles me everything about the dress looks 40's except for the the pattern that looks a bit 70's but also mimics Indian chintz designs. 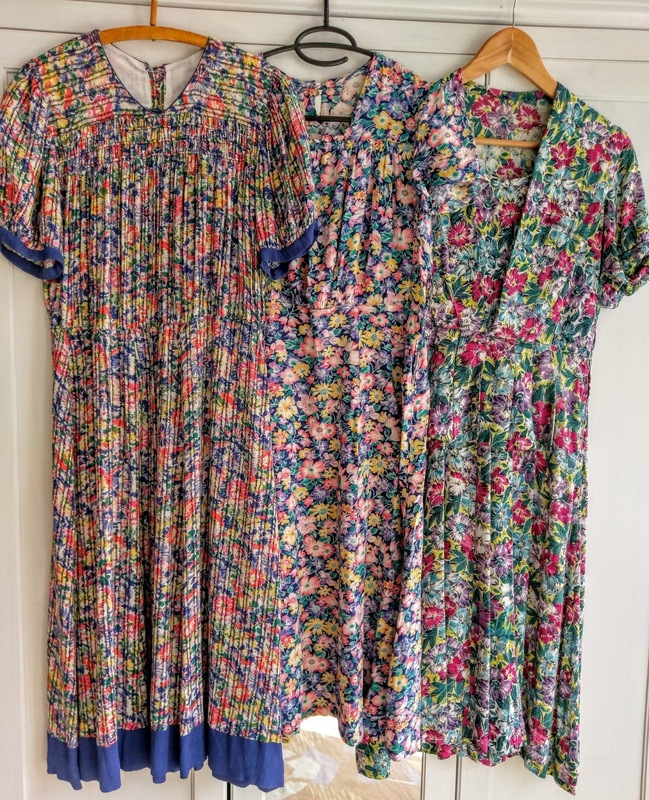 It could still be an original dress because I've seen some amazingly 70's prints that are actually from the 40's, but I'm not sure. 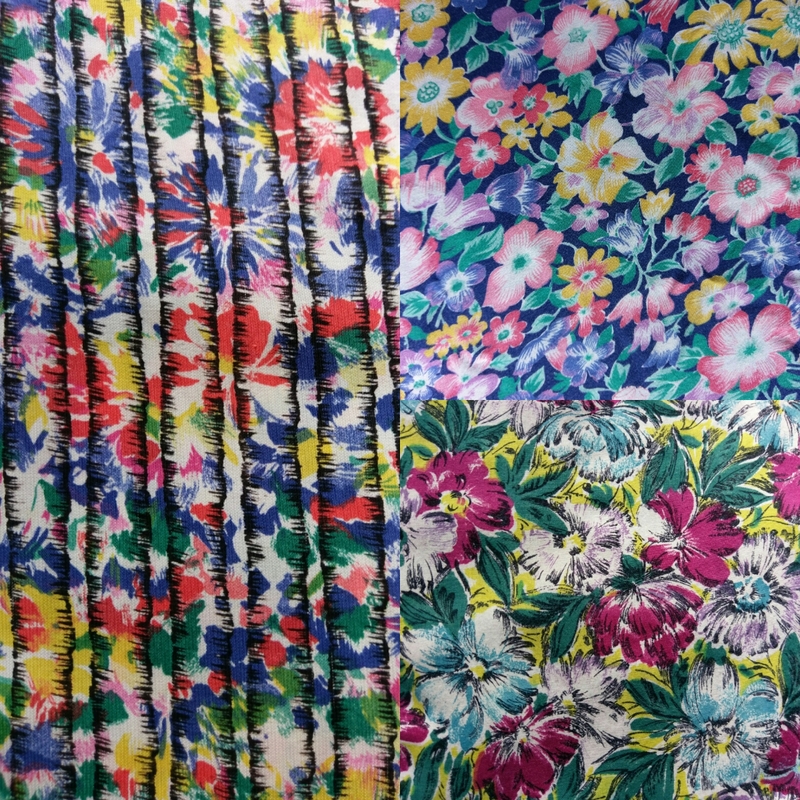 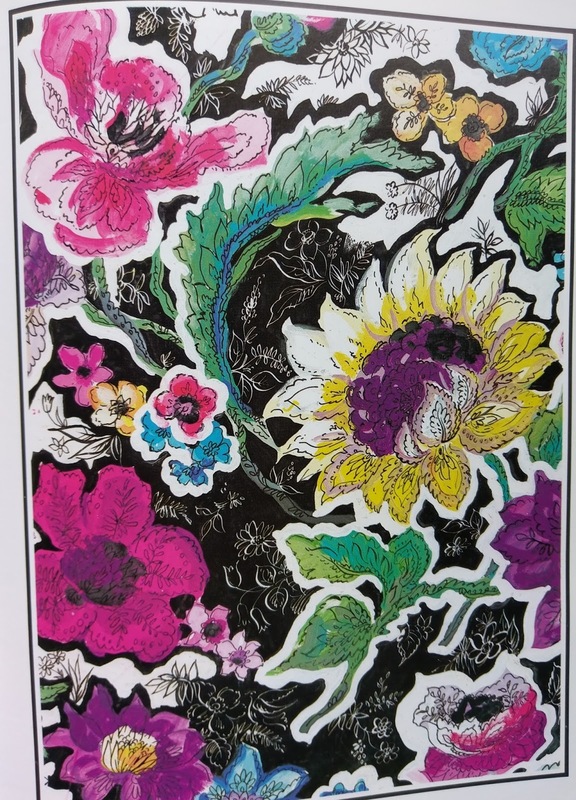 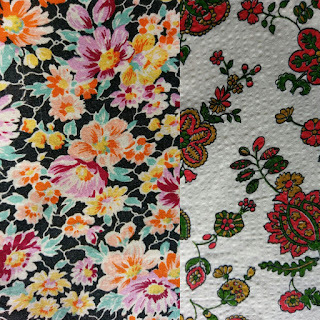 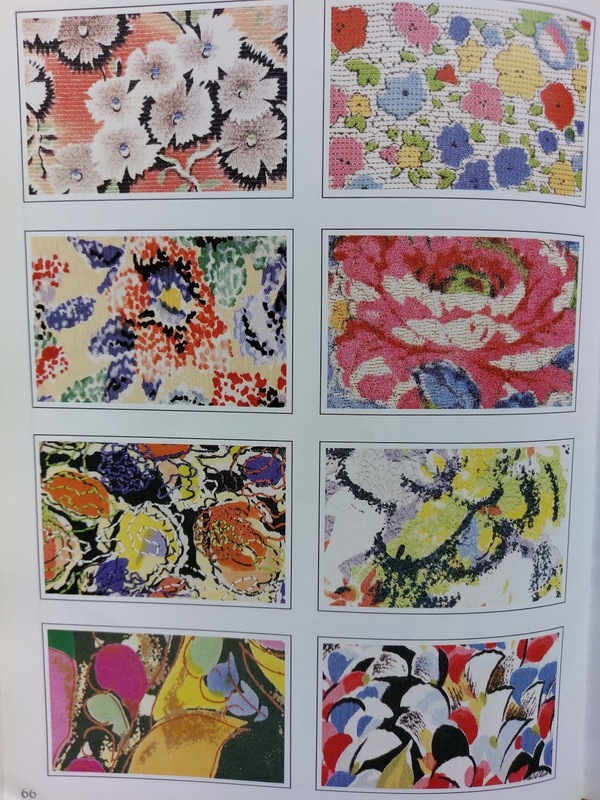 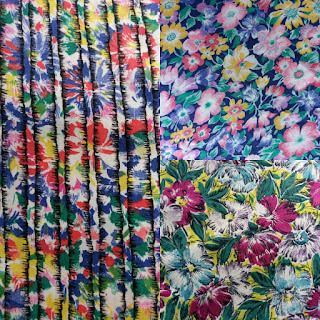 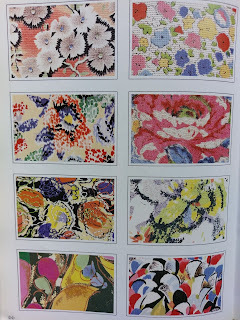 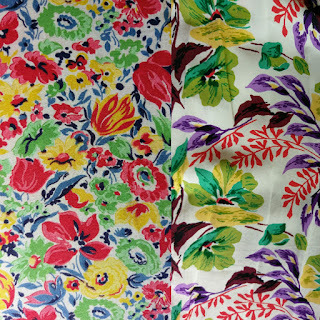 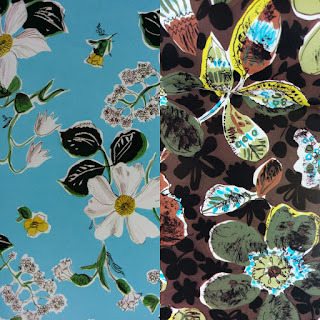 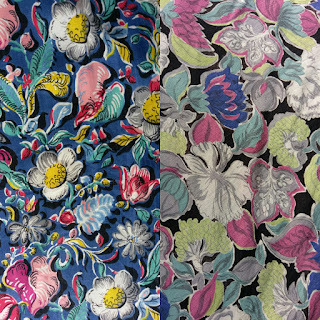 I would love to find a dress in this fabric! 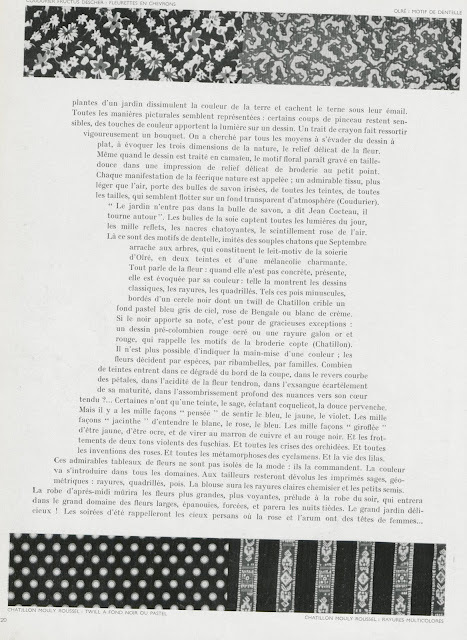 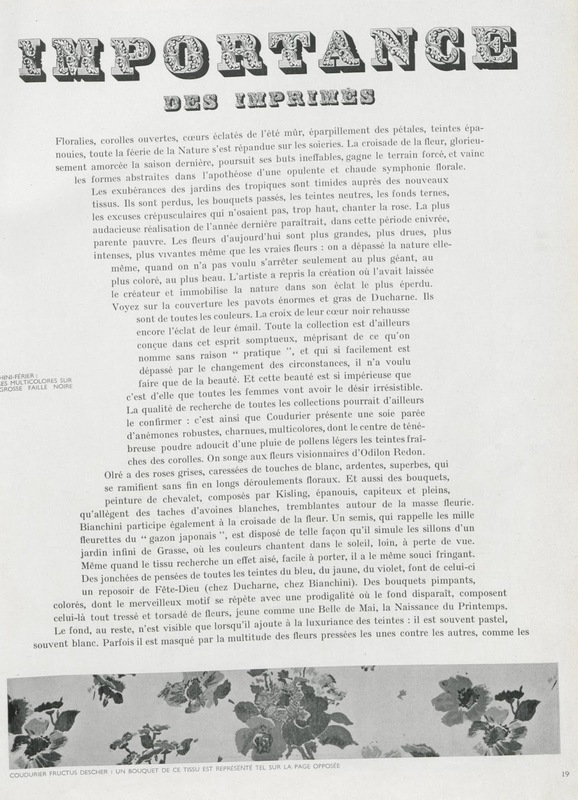 I also love to browse through old Vogues online (for those of you that don't know it yet: the French national library digitized the French Vogue until the beginning of 1940). 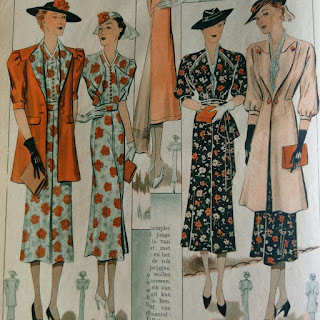 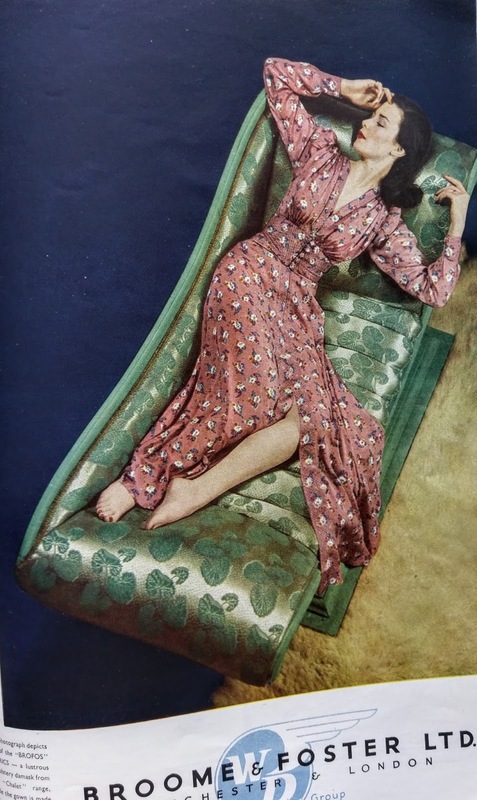 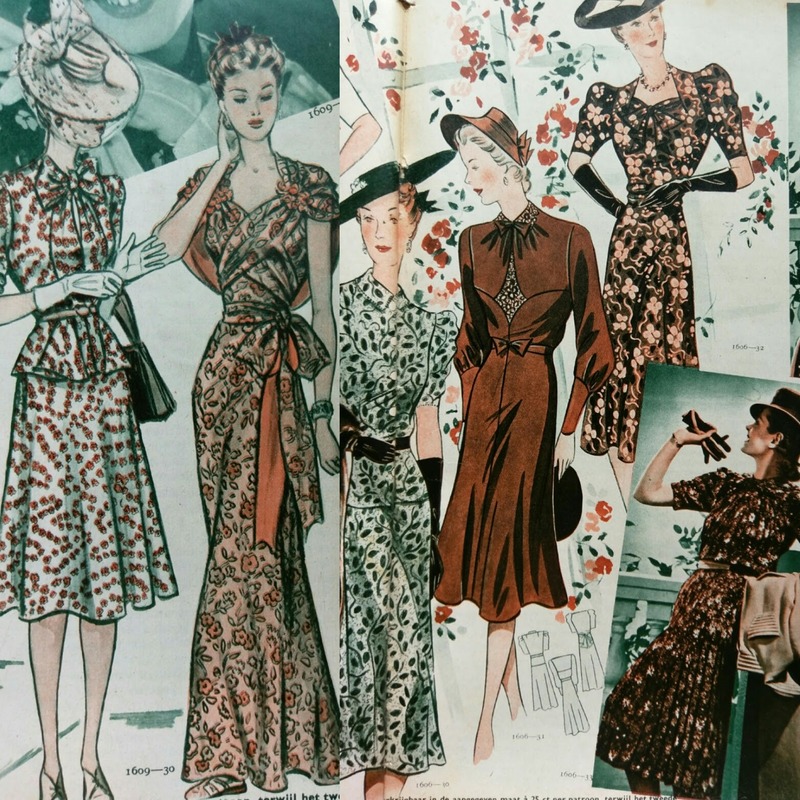 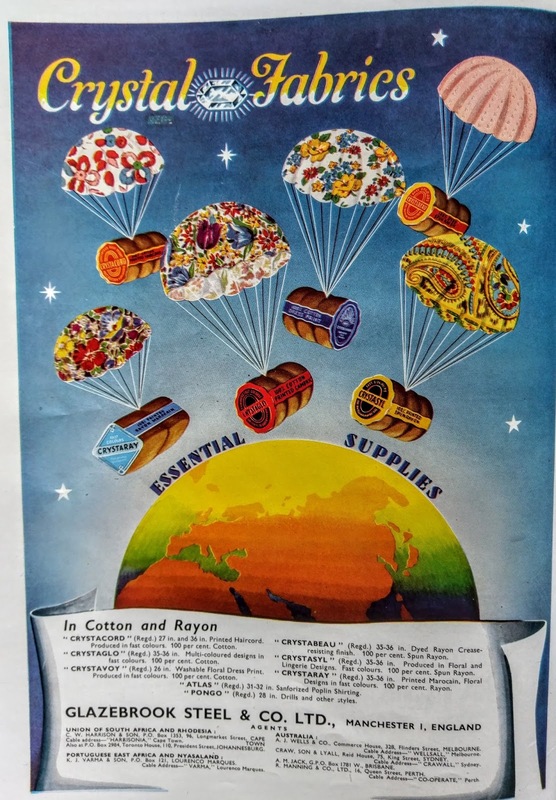 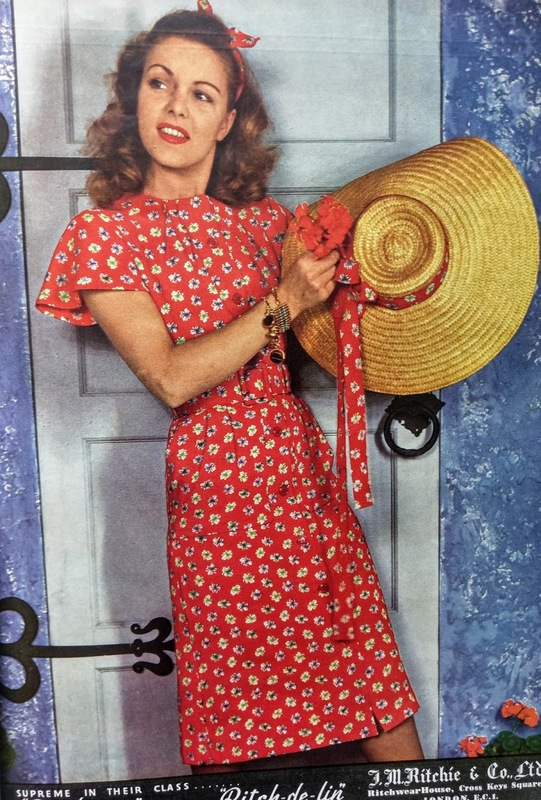 Some advertisements from a 1946 Brittish fashion fabrics magazine. 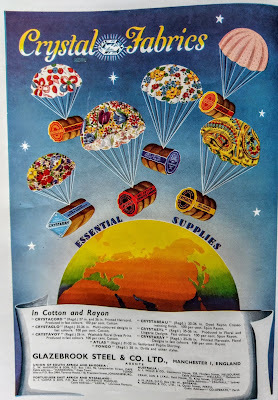 Interesting ad just after the end of the war with fabric still scarce. 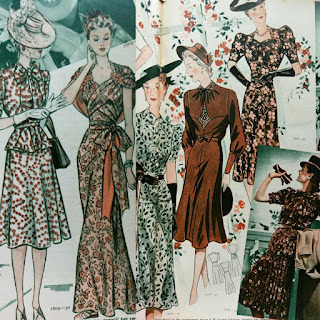 The second picture looks 1960's right? 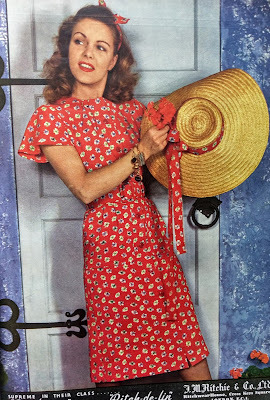 Well it is still from the same 1946 magazine. 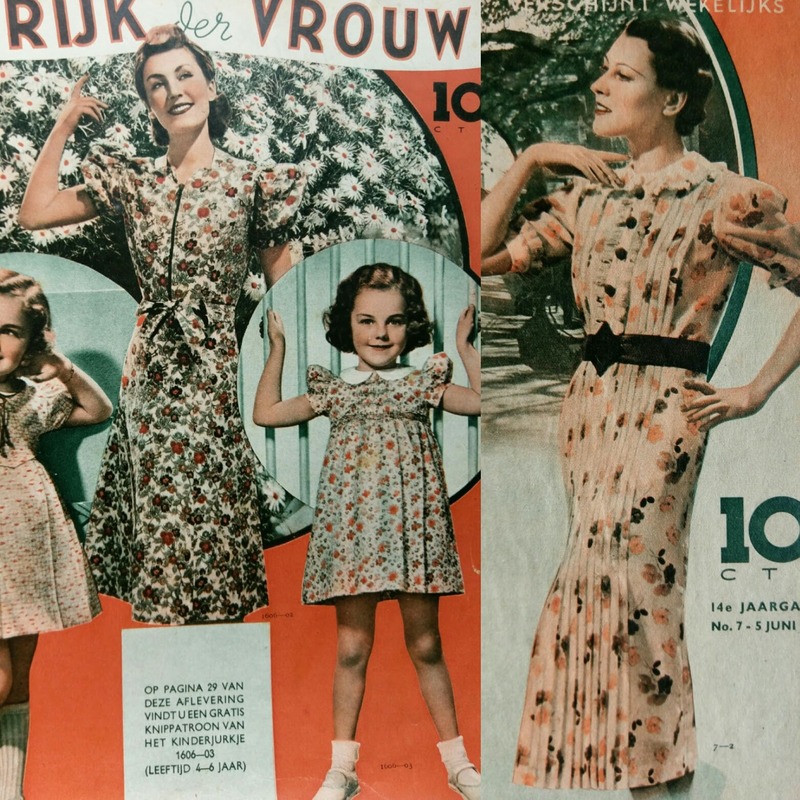 Forties flower power ;) Also take a look at the top right below.. 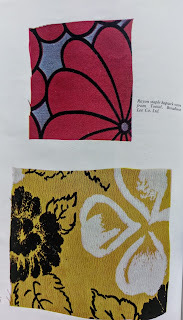 Fabric swatches used to be pictured a lot in magazines, I like that you can see the weave of the fabric. 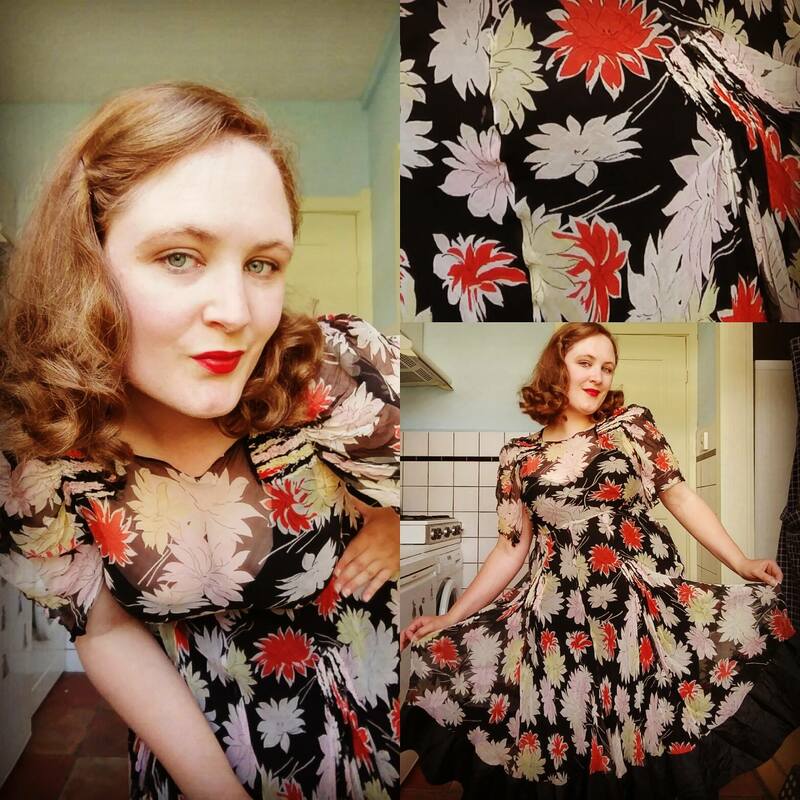 This concludes my pictorial ramble on floral dresses! 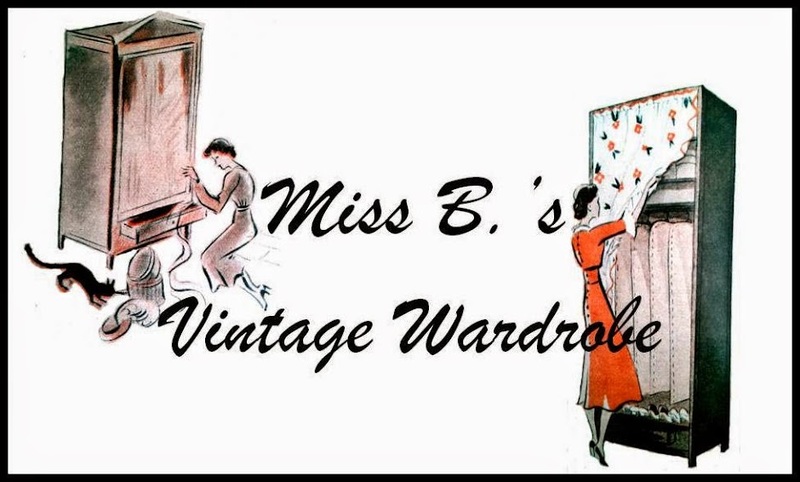 I hope a blog on the Tweedride will follow soon! 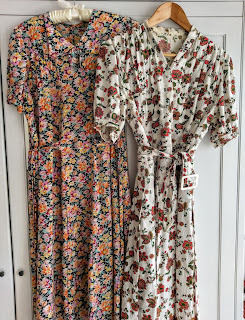 & if anyone has tips for vintage shopping in Prague I'd love to hear! Wow, this post was such a feast for the eyes! 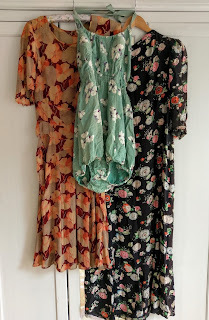 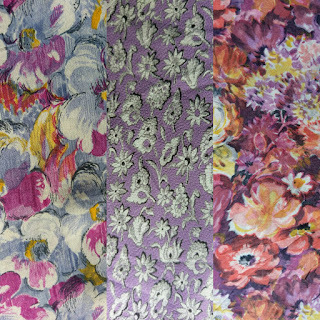 I adore florals, and I'm looking for some darker florals for my fall wardrobe.